Colombia, Vietnam, China. Do these places sound like somewhere you want to raise your child? They do to me! I’m a single dad and my 4-year-old has already lived in these countries and more. Some people ask me how do I–as a single parent digital nomad–raise my daughter? My response is always the same: how couldn’t I? Strapped with a mountain of student debt, exhausted from working two jobs morning-to-night, and thoroughly upset to return home only to see my daughter is already asleep, I was surviving in the United States, but not thriving. That’s when I started reading online and seeing phrases like ‘digital nomad’ and ‘travel family’ and ‘modern nomad’ and ‘location independent’ being thrown about. I saw families like The Holcombe Family doing amazing things. I should’ve reserved that judgment. It turns out, the nomadic life–the ‘travel family’ life–is just as attainable as the life I was living in the United States. That’s when I made a choice: I was going to work towards achieving what I saw as a better life for me and my daughter, the nomadic one. I’ve always loved travel ever since I did my study abroad in Costa Rica. But I knew the way I ‘studied’ in university was not going to look like my parenting life. I needed an attainable path to location independence. That’s when I started to work for it. I already had a skill: writing. I just needed to monetize it. So, I started this blog with this post talking about some serious mistakes I made in my personal life. If want to get started with building writing as income, I suggest you also start a blog! Check out Bluehost for an awesome web hosting service! Once I started my blog, I was able to fully engage with my choice. Let’s start by saying that I love the United States, and if I could afford to live there full-time on the work I do now, I would spend at least half my time there. Probably the summer in Michigan where I’m from, for example. I’m not to that point yet, so the choice I made was this: if I’m going to live off my writing now, before it’s enough to live in the USA, then I have to find somewhere where I can afford to live. I felt compelled to live off my writing. Not because it gives me the chance to live nomadically, but because I love writing, and I love the work I write about. My choice was this: give up a pair of good jobs in the United States that provide economic freedom, or live a life of love and freedom of choice each day. Both ways of living have their merits, anyone who chooses a good job in the USA is doing okay in my book, but it’s not a life I’m suited towards. I’m not built for alarm cooks, punch cards, and bosses staring over my shoulder. That kind of stuff drives me spiritually and mentally insane and takes a massive toll on my body. I’m built to wake up with the sun, and then fall asleep when it does. I thrive under my own direction, and when I fail I have no one else to blame it on. The integrity the nomadic life–and being a single parent digital nomad–has taught me keeps me driven and engaged in a way that is meaningful to me. And, as a bonus, I love the freedom to map out each day the way I see fit. 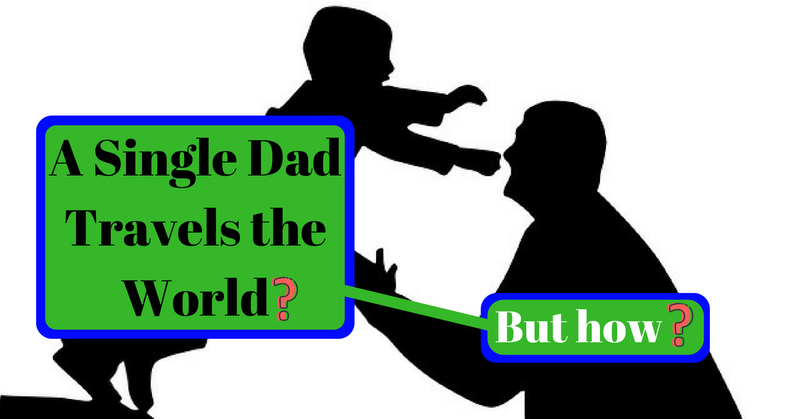 How does a single parent digital nomad raise his children? I do it only by knowing it’s the best route for my daughter and me. Her well-being is directly tied to my state-of-mind, and my state-of-mind is best when I am living a life that is self-actualizing. My daughter is safe, healthy, and learning so much about the world that she could never get out of a textbook in the US. No, I’m not making nearly as much as I once was, but I worry less about my income level on the road because it’s so much cheaper than living the US. And I’m able to live a healthy life full of activity, delicious food, and heaps of time with my daughter. So if you’re curious how a single parent digital nomad can raise their children on the road, I ask you back: how can’t they? If you enjoyed this article, consider SUBSCRIBING to my mailing list below 🙂 You’ll receive free content like this and awesome offers on my upcoming books!